Find all five pumpkins and you can enter a drawing for a gift card to your choice of Starbucks or Amazon! 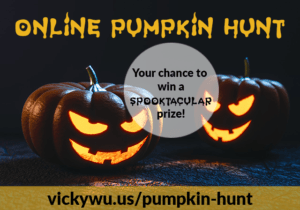 HINTS of where to find pumpkins will be provide on our Facebook page – connect to stay updated! Note: locations of pumpkins changes every few days! Claim one additional entry in the contest when you download our PDF Tips for Halloween Marketing. Note you must use the same email address that you will use to enter the drawing. (yes it’s long, so use a copy/paste). Want even more entries? Email me with your name and email address and I will provide you a personalized URL you can use when you share the contest using the hashtag above – and you will receive an entry for every person who visits the page from your link! Contest ends at midnight CST on October 31, 2017. Winners will be notified November 15, 2017. This entry was posted in Monthly Promotion Ideas. Bookmark the permalink.